The open-topped Gallardo is one of the most exciting cars in the world. Not for the shy retiring type though. Interested in buying a Lamborghini Gallardo? 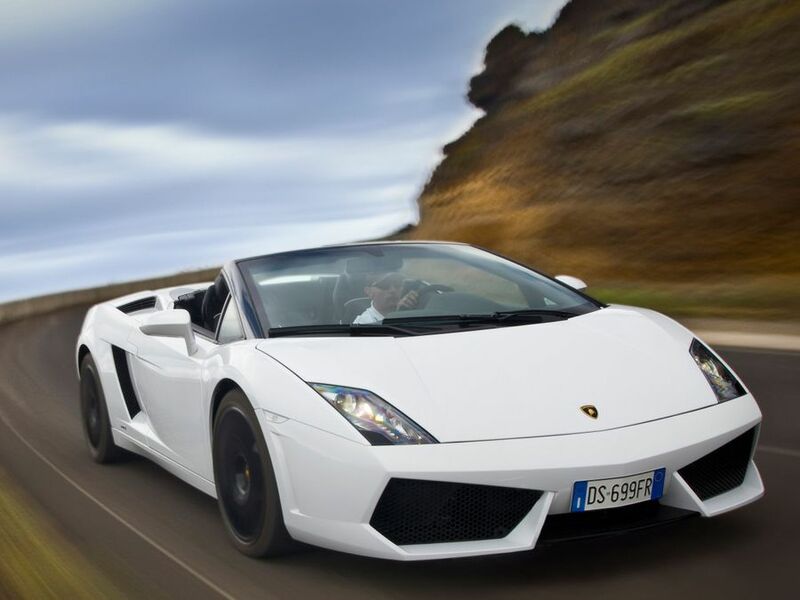 Although the Gallardo has been around since 2003 it’s still a real head-turner – and the open-top Spyder especially so. It doesn’t look quite as slick as the coupe with the roof up, but is nothing short of spectacular with it folded away. The Performante model really stands out with extrovert carbon detailing and a large fixed rear wing in place of the regular version’s retractable item. As in the Gallardo coupe, if you’re familiar with the latest Audis you’ll recognise some of the switchgear. That’s no bad thing, as it all works well and its action is well-damped. The Lamborghini has fantastic seats too and a lot of adjustment to allow drivers of all shapes and sizes to get comfortable. That Performante version’s cabin is carbon fibre overload, which may not suit some. All the Gallardo’s luggage space is in its nose, so the Spyder is no worse off than the coupe in that respect. Although, that still means only 110 litres to play with, so pack light in soft bags. Better still, opt for the fitted luggage. It’s no better inside the cabin, where there are precious few areas to store anything substantial. Some people will assume that the open-topped version of the Gallardo is softer and not as good to drive as the coupe, but that’s just not the case. Its road holding is no different and the experience is heighted by the close proximity of the sound from the engine. As before, the steering and brakes fit in with the personality of the car and four-wheel drive endows it with breathtaking cross-country ability, even if it’s raining. All Gallardos are powered by a 5.2-litre V10 petrol engine. In the Spyder, maximum power is either 552bhp in the LP 560-4 or 562bhp in the LP 570-4. The latter manages 0-62mph time in just 3.9 seconds, which may not be as fast as the quickest coupe, but by any other standards it’s rapid. That’s thanks in part to the traction afforded by the four-wheel drive system. Top speed is quoted as just over 200mph in all Gallardos. You can choose between a six-speed manual gearbox and a ‘robotised manual’ with paddle shift. The latter is better at fast driving than it is in town, but it does add to the experience. Like all supercars – junior or otherwise – running costs of a Lamborghini Gallardo are high. Insurance, tyres and servicing are all expensive, though no more so than in its rivals. Up to 20mpg is theoretically possible, but we’d not bank on it. Audi ownership of Lamborghini has paid dividends in terms of reliability. Even though Lamborghini owners tend to cover relatively high mileages the Gallardo has not had any reliability issues widely reported. It’s made in too low numbers to be subjected to any of the big reliability surveys. All the essential safety equipment is standard, such as front and side airbags, stability control and anti-lock brakes. The car’s brakes are immensely powerful and its strong structure is designed to protect occupants in a crash. The stability control system actually has several modes of operation that will appeal to more experienced drivers and those that use their car on track. Naturally a car such as the Gallardo is expensive to buy. Lamborghini does equip it fairly generously, including leather seats and climate control, but it’s easy to get carried away with the costly options list. The sat-nav system is Audi-sourced, so it’s good, while the reversing camera system is also tempting. While the Gallardo coupe clearly competes with the likes of the Ferrari 458 Italia and McLaren MP4-12C, neither of those cars have open-topped variants (as yet), so the Gallardo Spyder pretty much sits on its own in that respect. It’s just as good as the coupe in virtually every way.